Hillary Clinton won the ABC Democratic debate in New Hampshire—even though it was really a tie. 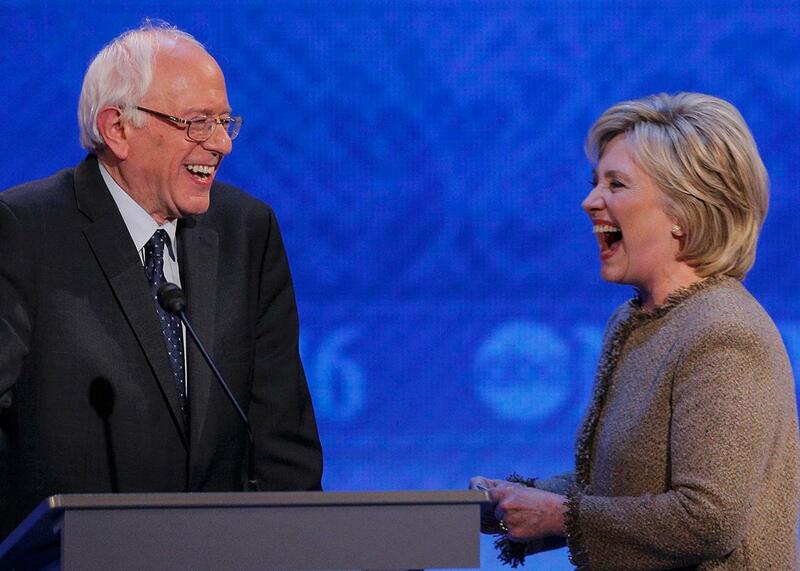 Hillary and Bernie Each Had a Pretty Strong Debate. That Means Hillary Won. Bernie Sanders and Hillary Clinton at the debate in New Hampshire on Dec. 19, 2015. In an evenly matched debate, one in which the two leading candidates each have their strong moments and some blah ones, who could possibly be named the “winner”? The answer is the one who was already winning heading in—especially when she, Hillary Clinton, was the only one to receive an onstage apology from her main (and trailing) rival. The sparks over #Datagate—or whatever we’re calling the events that led to Democratic horse race drama outshining Republican horse race drama for a whole 36 hours this week—were extinguished early on. About 14 minutes into the two-hour debate, Sanders reiterated his campaign’s talking points about how a) he had axed the staffer who breached the Clinton campaign’s voter data and was investigating further misconduct; and b) it was completely unfair and over-the-top for the Democratic National Committee to temporarily lock his campaign out of its own voter data. Then the moderator offered him an opportunity to apologize to Clinton. You could tell that Sanders wasn’t as gung-ho as his advisers surely were about railing against the DNC long into the night, a surefire plan to rally the grassroots. He seemed relieved, and earnest, in his apology. Clinton accepted it and they all, after a weird detour from Martin O’Malley—who was also at the debate Saturday night, mostly being annoying—agreed to move on. From then on we saw several familiar dynamics from previous debates emerge. On foreign policy, Sanders may have struck the better broad tone for an electorate still leery of interventionism, but Clinton demonstrated, once again, that she is simply more experienced with and fluent in the issues. With all due respect, senator, you voted for regime change with respect to Libya. You joined the Senate in voting to get rid of Qaddafi, and you asked that there be a Security Council validation of that with a resolution. All of these are very difficult issues. I know that. I’ve been dealing with them for a long time. And of course we have to continue to do what is necessary when someone like Qaddafi, a despot with American blood on his hands, is overturned. But I’ll tell you what would have happened if we had not joined with our European partners and our Arab partners to assist the people in Libya. You would be looking at Syria. Now the Libyans are turning their attention to try to dislodge ISIS from its foothold and begin to try to move together to have a unified nation. Clinton’s statement that Sanders “voted for regime change” in Libya is questionable, since Congress didn’t vote on the issue, which was part of the whole problem: The Obama administration just announced late in the afternoon one day that it would establish a no-fly zone in Libya. (The Sanders campaign believes Clinton is referring to this nonbinding resolution that basically said Qaddafi is terrible and should go.) Because the ABC moderators were frequently awful, Sanders never got an opportunity to respond. But he didn’t seem too upset with that, either. Later in the night, when the issue came up again, Sanders again didn’t jump in to defend himself against Clinton’s charge. Beyond that, though, Clinton did offer an acceptable defense of the Libya intervention, one that’s worthy of legitimate debate. Unlike the previous debate, Clinton was able to withstand an assault on her closeness with Wall Street without retreating to “Hey, look over there, 9/11!” Instead, she pointed out that “there are currently two hedge fund billionaires running ads against me here in New Hampshire,” going on to outline the parts of her agenda that aren’t exactly fetching to Wall Street. She ably shot down an attack from O’Malley on the nature of her Wall Street contributions by pointing out O’Malley’s own record of contributions. From then on, Sanders and Clinton debated their proposals on taxes, health care, and education from the left and center-left, respectively. Both gave solid performances. But it’s hard to see how either could have taken many supporters from the other. Since Hillary Clinton came in with more supporters, and was able to parry off attacks on her vulnerabilities well enough, the tie goes to her.